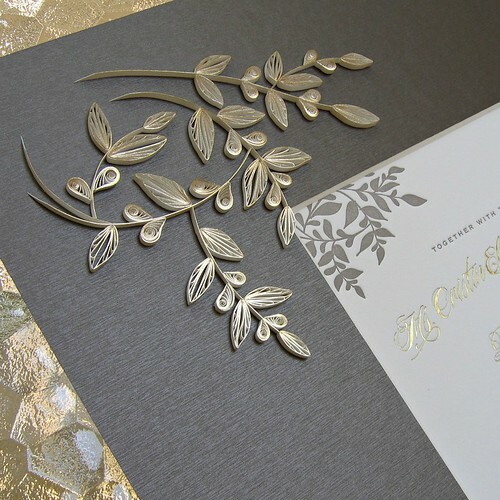 Recently I created a wedding invitation mat for a Nashville couple by quilling a design to mimic the leafy branch motifs. 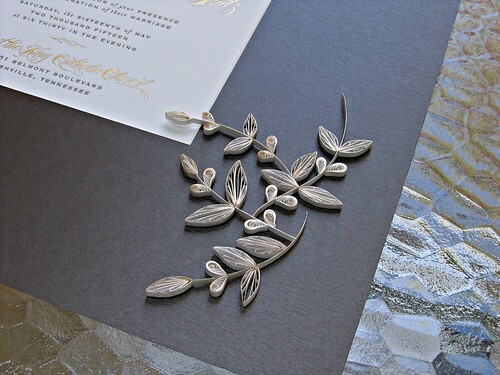 Gilded white paper from JJ Quilling Design complemented the gold foil lettering on the letterpress invitation. There are many shades of metallic gold and I was lucky these two matched so well. Alternate side looping is my favorite quilling technique so I folded ASL leaves in a variety of sizes and filled in with shaped teardrop coils. A cool thing about gilded white paper is that the metallic shine is clearly visible when looked at straight on or if a light shines on it from above, but from the side, as you see in the photos below, it mainly appears white. 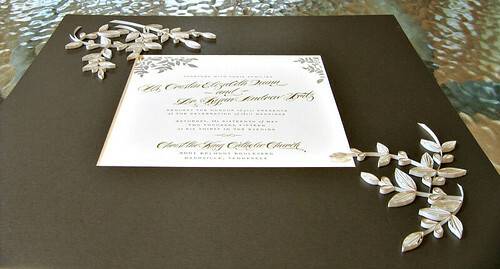 Choosing a mat proved to to be the biggest challenge as the color of the invitation leaves was chameleon-like. I would study them and think 'oh that's gray' but with the next glance I was sure they were brown! Luckily my reliable frame shop had just stocked a line of mat board with an elegant sheen. It married well (pun!) 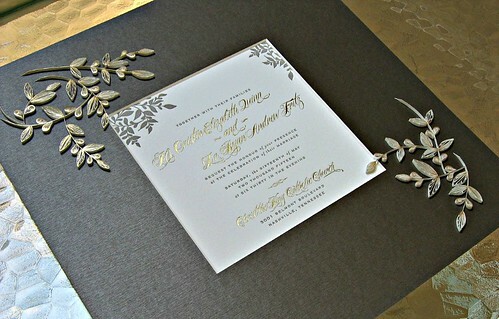 with the dressy invitation and was even available in a color that solved the grey/brown conundrum. I always enjoy seeing your quilled invitations. So beautiful. So lovely. Beautiful work, Ann. So elegant design! Ann, your wedding invitation is so beautiful! Love it! Beautiful! I do wedding frames sometimes based on friends' wedding invitations and like you, do the quilling based on the design of the actual invitation. I love how your intertwining leaves turned out! So classic and timeless Ann. It's a beautiful accompaniment to their invites.